Transient cytosolic calcium([Ca2+]cyt)elevation is an ubiquitous denominator of the signaling network when plants are exposed to literally everyknown abiotic and biotic stress. These stress-induced[Ca2+]cyt elevations vary in magnitude,frequency,and shape, depending on the severity of the stress as well the type of stress experienced. This creates aunique stress-specific calcium "signature" that is then decoded by signal transduction networks. While most published papers have been focused predominantly on the role of Ca2+ influx mechanisms to shaping[Ca2+]cyt signatures, restoration of the basal[Ca2+]cyt levels is impossible without both cytosolic Ca2+ buffering and efficient Ca2+ efflux mechanisms removing excess Ca2+ from cytosol,to reload Ca2+ stores and to terminate Ca2+ signaling. This is the topic of the current review. The molecular identity of two major types of Ca2+ efflux systems, Ca2+-ATPase pumps and Ca2+/H+ exchangers, is described, and the irregulatory modes are analyzed in detail. The spatial and temporal organization of calcium signaling networks is described, and the importance of existence of intracellular calcium microdomains is discussed. Experimental evidence for the role of Ca2+ efflux systems in plant response stoarange of abiotic and bioticfactors is summarized. 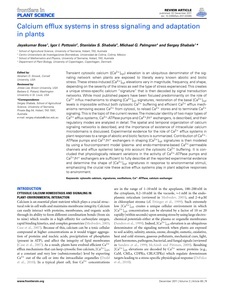 Contribution of Ca2+-ATPase pumps and Ca2+/H+ exchangers in shaping[Ca2+]cyt signatures is then modeled by using a four-component model(plasma-and endo-membrane-based Ca2+- permeable channels and efflux systems)taking into account the cytosolic Ca2+ buffering.It is concluded that physiologically relevant variations in the activity of Ca2+-ATPase pumps and Ca2+/H+ exchangers are sufficient to fully describe all the reported experimental evidence and determine the shapeof[Ca2+]cyt signatures in response to environmental stimuli, emphasizing the crucial role these active efflux systems play in plant adaptive responses to environment.